The tanto is the knife used by the Samurai. Length of blade ranged from 5" to about 12". The tanto was frequently carried in place of the wakizashi and was often used against longer weapons. 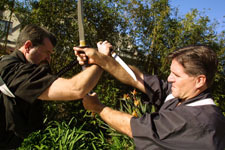 There is an extensive repertoire of techniques in the Nami ryu tanto jutsu system that cover a wide range of applications. Wooden or aluminum knives are used in training and live blades are used in form practice and tameshigiri. The tanto waza directly impact many of the empty hand techniques used in aiki jutsu. These techniques and strategy have very practical modern function both for knife on knife applications as well as knife against bludgeoning weapons and empty hand against knife. Unlike knife fencing systems in tanto jutsu controlling the opponent is stressed. Any contact includes gathering and controlling the opponents mental and physical center. As in kenjutsu, tanto jutsu and aiki jujutsu are two sides of the same coin. The tanto, whether used for cut or trap, controls the opponent.